There was no Avengers awesomeness this year (despite two of the team appearing in solo films) but it was still a pretty good year for fantasy and sci-fi movies. Here's the best of the best . . . Worst Screenplay: Star Trek Into Darkness (Roberto Orci, Alex Kurtzman and Damon Lindelof) – it’s a testament to the talent of the director and cast that this film still made my best of the year despite the script being a ludicrous “reimagining” of The Wrath of Khan. Elysium - exciting utopian/dystopian sci-fi that is actually about the world we live in today. Something of a comedown for Neil Bloomklamp after District 9, but still good. The Conjuring - a stylish piece of old school horror. Wish it didn't perpetuate the myth about evil witches, though. Man of Steel - pretty much as bad as I expected. Mindless action, little to no character development, surprisingly subpar CGI and a Superman that lets his father die, doesn't seem to care about collateral damage and snaps necks. Come back Brandon Routh, all is forgiven . . . Finally caught the whole of The Hobbit: The Desolation of Smaug. For the most part it was better than An Unexpected Journey, since the setup was out of the way. Although the part of the book it adapts is actually pretty uneventful, aside from finally meeting the dragon, Peter Jackson and co. manage to inject more action and plot into this segment of the story, though not always successfully. Beorn the skin-changer makes for an interesting character visually, though his importance to the story is not clear, at least in this film. The encounter with the spiders of Mirkwood is an early highlight that actually manages to outcreep Frodo's encounter with Shelob in The Return of the King. The addition of Ms. Elf not appearing in the book, Tauriel, is somewhat annoying, especially as she mainly serves as a love interest for both Legolas (also not appearing in the book) and hunky dwarf Kili. Evangeline Lilly plays the part well, though. Lee Pace makes a beautiful King Thranduil, though he overacts a little. The barrels out of bond sequence is greatly expanded from the book and is a fun action scene, though some of the acrobatics are too over the top. The film slows down a little for the Lake-Town sequence, though the depiction of the town is visually pleasing and it's nice to see Stephen Fry as the Master. Speaking of Stephens, Stephen Colbert plays a spy in the town (his cameo is almost as easy to spot as PJ's at the beginning of the movie). Finally, after some political shenanigans, the company reaches the Lonely Mountains and Bilbo awakens Smaug. The dragon is a beautifully rendered creation and Benedict Cumberbatch's vocal performance shakes the cinema. He also provides double duty as the voice of the Necromancer (better known as Sauron) who traps Gandalf much as Saruman will later in the story. 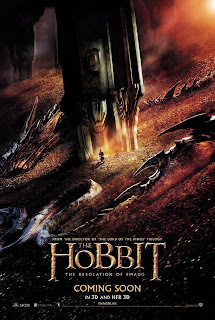 Unfortunately, as enjoyable as the dragon scenes are, the film has somewhat overstayed its welcome by this point, with too many extraneous scenes taking attention away from the main plot (hello Legolas vs random orcs). The cliffhanger ending will delight some and frustrate others. 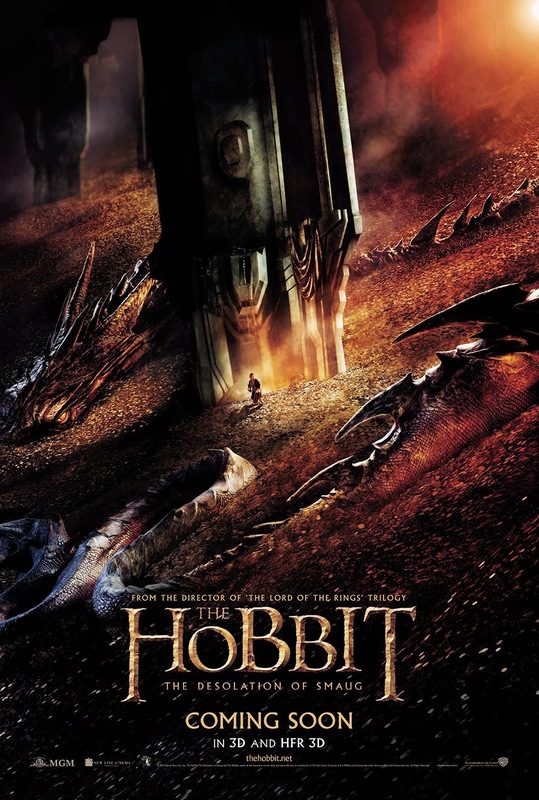 Overall, the film is impressive while still not reaching the heights of the LOTR trilogy. The actors are all good in their roles, with Martin Freeman once more demonstrating that he is the perfect Bilbo. The visuals are awesome, though I don't like the overuse of CGI orcs which lack the menace of the actors in makeup in the previous trilogy. I did appreciate not seeing it in 48 frames per second, which is antithetical to film in my opinion. Hopefully the final film in the trilogy, There and Back Again, will makes up for the flaws of the first two parts, especially as it contains the Battle of Five Armies, which should be awesome on screen.